Finally got around to taking some pictures of my latest two models. 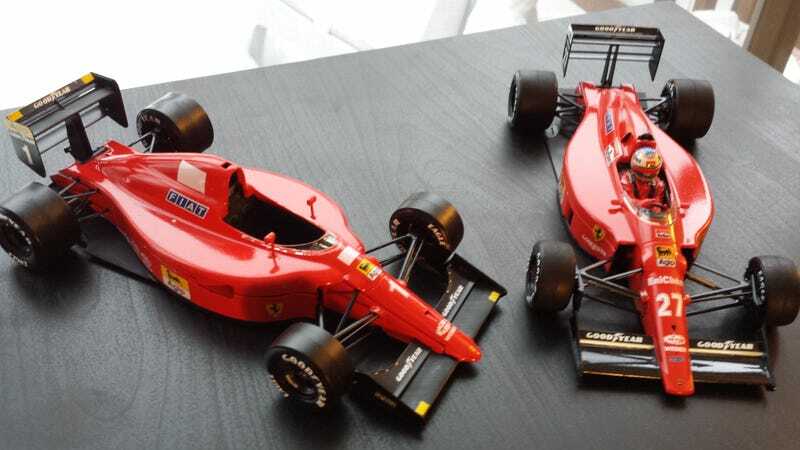 F641 and the F189, 1990 and 1989 Ferrari F1 entries. Finished them up shortly after Christmas break. One is a Tamiya and the other Fujimi. I took a gamble and did a carbon decal kit on the '89 car which turned out OK. The tub has some noticeable errors but the diffuser and wings turned out real well. Its piece together for the pictures as I plan on displaying in open and with the wheels off. I have a second one that will go together at a later point and be fully assembled. You can see here that the cowl is just resting in place at the front. It sits nice and flush with a little force to snap it in place. Some time in the future I need to make a light box so I can take some good photos, but that's pretty low on the priority list. For now potato shots from my living room will have to do. The carbon detailing on the floor turned out really well. It just took a lot of patience to get it right. Next maybe some silver decals for the floor instead of paint because the finish is lacking. The carbon tub is also a nice touch and you can see the back of it here. The mistakes around the radiator ducting are visible here (white spots where the decal peeled) but it adds a cool dimension to what I'd otherwise paint a boring black. There are so many options for adding extra details but they drive the price up considerably. I paid $20 for the kit and another $30 for the carbon decals. Plus you can add seatbelts, another $20, (won't bother with those ever again) metal parts and so on. I might do the carbon again for something I really like but otherwise I'm too cheap to bother with something that'll never be seen. Still learning as I go though and each one keeps getting better and with fewer mistakes. A great way to keep occupied when its cold out, but I'll have to put this on hold once my engine returns. Spring will be here soon and so will race season.